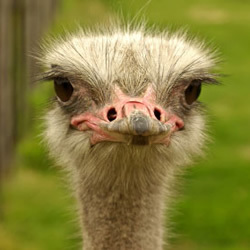 Ostriches are the largest and fastest birds in the world and can weigh as much as 350 pounds and live up to 75 years. They are the only birds with two toes per foot that can propel them to sustained speeds of 35 mph with bursts to 45 mph. Ostriches can lay eggs until 40 years of age and lay the largest of all bird eggs, weighing 3-5 pounds each — yet relative to the size of the bird, they are the smallest. Each ostrich egg is equivalent in size to 18-24 chicken eggs! The contents of each emu egg are the equivalent of 10-12 chicken eggs! Ostriches do not bury their heads in the sand! 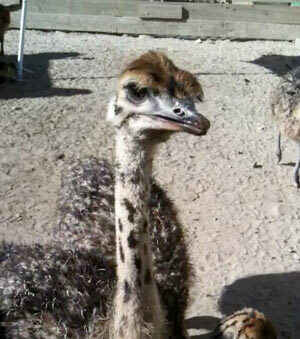 Ostriches Co-parent — the female will sit on the eggs during the day, and the males will at night. The female’s light coloring helps her blend into the sand better during the day, while the male’s darker coloring offers nighttime protection of the nest. The male ostrich is responsible for choosing location and preparation of the nest. All members an Ostrich colony lay their eggs into the communal nest established by the dominant pair. Male ostriches are quite strategic in protecting their colonies. They will feign injury to lure predators away from chicks and females. They will fight when they have to and can kill with one kick. Not even a lion will prey on a healthy mature ostrich. Ostriches grow a foot per month until they reach 8 or 9 feet tall. Ostriches have no teeth. They swallow pebbles to help grind the food in their gizzards. Ostrich meat is low in fat and cholesterol. The flavor is often compared to lean beef. It is high in calcium, protein and iron.